I don’t think I’ve ever had a more difficult time trying to find a defensible angle for a cartoon, and this one doesn’t provide much of a firm stance. I think when it comes down to it, no one can predict what is going to happen, or whether intervening or ignoring the red line and backing down will escalate the conflict further. I don’t believe comparisons to Iraq, Kosovo, or Libya provide any real insight, and a regime as unstable as Assad’s is capable of anything. That being said – with unpredictable outcomes being equal, I would reluctantly advocate for the “inaction” door on the right. 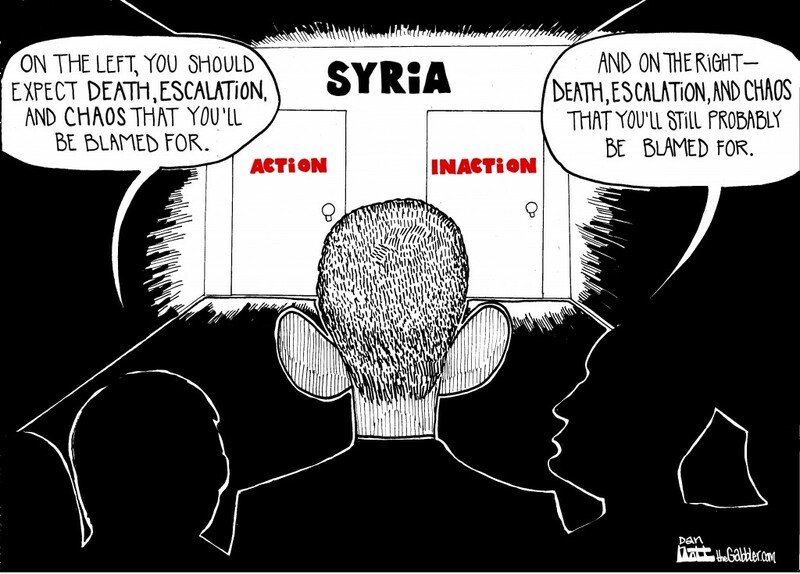 A great cartoon/commentary, Dan, depicting the dilemma Obama and all of us are faced with. It sure seems like a lose-lose situation. I don’t think its a choice of action or non-action. It’s a question of right action. As the world leader, we need to sit down face to face with Iran, Saudi Arabia, Jordan, Iraq, Turkey, etc. and have a dialogue about how to handle the Syria ‘crisis.’ I believe if the United States proposes an unconditional, respectful meeting of friend and foe, real progress toward non-violent options to this very dangerous situation can prevail. We need to put aside our ‘saving face’ attitude and start savings lives!